Greenstone Properties, which owns the Boise Hawks was going to buy land at Americana & Shoreline from St. Luke's. Now that's not happening. BoiseDev broke word that the parcels would be instead sold to Agri Beef and an investment group. The company says it now wants to build the ballpark on the other side of the Connector - in Boise's west downtown region. The possible site is at Whitewater Park Blvd. and Main St. on the southeast corner. This is NOT the CWI campus location where Mayor Bieter had suggested the stadium could go earlier this year (it's the opposite corner). LocalConstruct, which owns that ground, has not made a deal to sell it to Greenstone just yet. Hawkins Co., which was developing the commercial portion for the site, pulled out late last year. There are other potential sites in the west end, which currently has several large tracts of undeveloped land. The vocal Concerned Boise Taxpayers group says it's glad the Americana & Shoreline spot has been dropped, but still has concerns on how another site - particularly around how it would be paid for. "If they are planning on using the same financing process without a due process and a vote from the taxpayers, then we still have the same concerns," CBT's Bill Ilett said. A new CCDC urban renewal district that would include the former Americana & Shoreline stadium site is still on track. CCDC Executive Director John Brunelle says the existing 30th Street district could be helpful for a stadium, but "CCDC would need to amend the 30th Street URD Master Plan if such a proposal materializes for that district." According to deeds recorded with Ada County this morning, two parcels that were to be sold by St. Luke's Health System to Greenstone Properties for a new stadium project have been sold to other parties. The property along the Boise River at 1471 W. Shoreline Drive that was at one point earmarked for condos and commercial space has been instead been sold to RDT Real Estate, which is controlled by Agri Beef president Robert N. Rebholtz, Jr. according to filings with the Idaho Secretary of State. A representative for Agri Beef said Rebholtz was out of town and unavailable to comment. Agri Beef's headquarters sites along Americana Blvd., next to the newly-acquired chunk of land. Earlier this week, Agri Beef filed plans with the City of Boise to demolish the former The Pantry restaurant to build a parking lot on the site. Rebholtz's RDT Properties acquired this parcel after The Pantry closed in 2016. The second, larger property at 1500 W. Shoreline, which is currently home to a variety of functions for St. Luke's Health System was sold to another group - Ameri Shore, LLC according to those deed records. Ameri Shore is controlled by Spokane attorney John D. Munding. Munding was also unavailable for comment this morning. As BoiseDev first reported yesterday, Greenstone is considering a site currently owned by LocalConstruct LLC at Fairview Ave. and Whitewater Park Blvd. build its proposed Boise Sports Park. and has recently decided to put its full focus on that area for the project. said Greenstone principal Chris Schoen. The Knitting Factory is set to make a series of improvements that will allow it bump up the number of concert attendees it allows inside. The venue, located in the 8th Street Marketplace in Downtown Boise, has had a maximum capacity of 999 for years - since it opened as the Big Easy in the late 1990s. Now, an additional restroom and changes to emergency exits will allow another 196 people in the building between the first and second floors. The existing 15,157 square foot space will not be expanded, but reconfigured to get the occupancy count up - key for a venue that runs on ticket sales. The project will cost about $35,000. A proposal by Greenstone Properties for a Downtown Boise stadium and multi-use development will not happen at a site at Americana and Shoreline, according to city councilor and CCDC board member Scot Ludwig. Ludwig said the project could move to another site nearby. So why the site change? "I assume changing sites is a result of Greenstone listening to Boiseans' valid concerns about the Americana site," Ludwig said. For its part, St. Luke's Health System, which owns the Americana and Shoreline site says it is still working with Greenstone, according to a spokesperson. Whitewater Park Blvd. on deck? Several sources who declined to be named on the record tell BoiseDev that new site could be land currently owned by LocalConstruct on the southeast corner of Whitewater Park Blvd. and Main St. This parcel of land isn't to be confused with a site earmarked for a future College of Western Idaho site on the northwest corner - which Boise's mayor had at one point suggested could be a better stadium spot. "I'm afraid that any commentary on anything having to do with (the ballpark) would have to come from Chris Schoen's team," LocalConstruct president Mike Brown said. "I can just tell you that in everything we do we believe that what's good for Boise is good for us, so we try to be helpful, be good citizens and team players, and set a good example." LocalConstruct traded the Spaulding Ranch in west Boise with the City in 2017 for the 6.3 acre parcel at Whitewater Park & Main. The plan was to construct a mixed-use development with residential and commercial. Hawkins Companies principal Gary Hawkins said his company had been involved with the planned commercial part of the Whitewater Park & Main project, but ultimately decided to end participation late last year. Ludwig did not confirm the west downtown concept - but said more should come out soon. "I understand an announcement on this location is expected soon," Ludwig said. "Despite the slow process, getting the site right for this incredible amenity for Boise has always been Chris Schoen's goal." A series of emails and calls this week to Schoen have gone unanswered. Monday, Boise Hawks president Jeff Eiseman said the overall project was "still a go." "When we are ready to make announcements we will," he said. "The project always evolves but still on the path." Eiseman did not respond to further questions around specifics. Ludwig said a plan for funding the stadium at a new location isn't in place, but "the City, CCDC and/or GBAD will no doubt partner in some fashion to provide a good fiscal plan to be determined." Bill Ilett with Concerned Boise Taxpayers says a potential change in venue for the ballpark helps allay some, but not all, of his group's concerns. "I think we have always said 'wrong location and bad project,'" he said. "Well, they have solved the wrong location by moving it out of the Americana area. (But) if they are planning on using the same financing process without a due process and a vote from the taxpayers, then we still have the same concerns." "We are aware of the conversations that have been happening among property owners that could involve a relocation of the sports park to a location in the west end," City of Boise spokesperson Mike Journee said. "It's their deal to be made." There's a grand idea afoot to build a ballpark in Downtown Boise. But major roadblocks remain. Progress on a stadium for Downtown Boise? Tax dollars have been set aside to look into a stadium in Downtown Boise. Boise's booming Clearwater Analytics has announced a new chief executive officer, as filings show it will expand its Downtown Boise headquarters. Sandeep Sahai is on a quick rise with the company. He joined the board of directors in September 2016 and was bumped up to executive chairman in March before taking the CEO role this week. 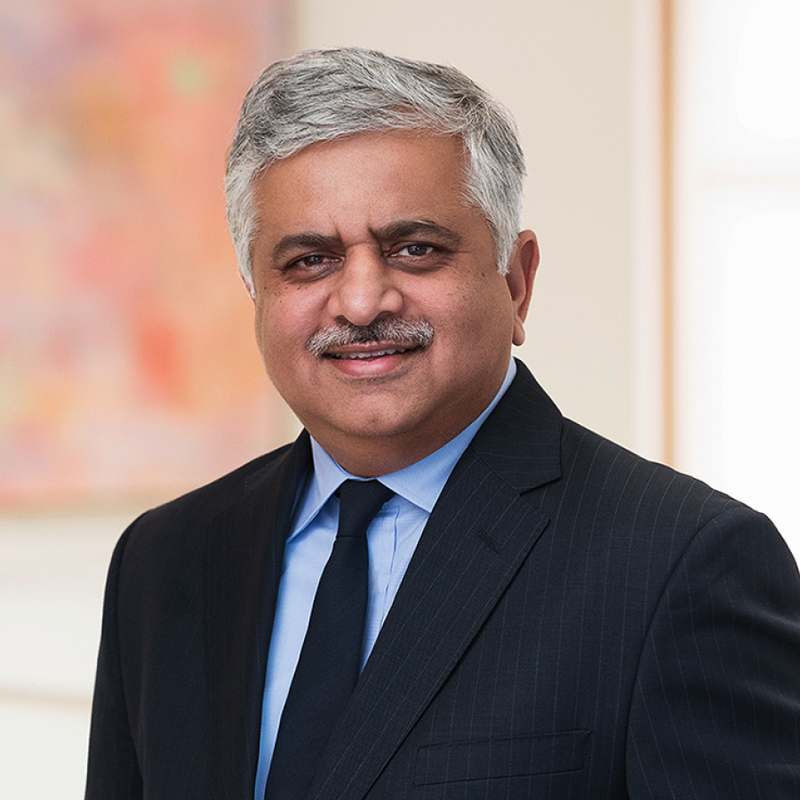 His previous CEO experience includes Headstrong - a former company in the financial services space which is now part of Genpact. He replaces co-founder David Boren in the job, who will remain on the board of directors. The company plans to build out an additional 26,218 square foot space in its building on the Grove Plaza in Downtown Boise. The space had been unoccupied since Clearwater moved into the building in 2016 and had been designated for future growth. Once complete, the fifth floor will "support business on floors 6-9" in the building. New team rooms, conference rooms, offices and training rooms are part of the buildout. Clearwater Analytics offers web-based investment accounting reporting software solutions. David Boren, Michael Boren and Doug Baltes founded the company in 2004. It now employs more than 650 people. The event spaces at the Owyhee building are up and running again - with new management and a new name: Agape Event Center at the Historic Owyhee. Bettina Debenham is owner and wedding planner for the venue. She founded Agape Ceremonies and Events in Eagle in 2014, with the addition of the Owyhee space this past March. She says she's excited about the opportunity. "We are in a prime location in downtown Boise," Debenham said. "The venue is newly remodeled and beautiful. Thus, being both practical and beautiful we expect this space being filled very frequently with for all of the above events listed above and more." The Owyhee has three ballroom spaces that can be operated separately, or as one large room. "We are open for all types of events and venue needs. This includes, but is not limited to, business meetings, lectures, weddings, receptions, dinner parties, holiday parties, tea parties, whatever parties." Debenham says they offer a full-service environment for clients - including wedding and event planners. As part of the initial revamp of the Owyhee in 2013, the capacity for the event spaces was expanded from a capacity of 220 to 350 people. With the new Fowler apartment project done in downtown Boise, it left a dark, mostly-bare wall on its backside, facing busy Myrtle St.
Now that large brown wall is being turned into a canvass for one of the largest murals in Idaho history. David Carmack Lewis is at work on a huge installation that will be more than four stories tall and roughly 103 feet across - with brilliant blues, yellows and pinks mixing in with the building’s existing deep chocolate color. Developer LocalConstruct first worked with Lewis on the art project at its Watercolor project in west downtown. It hired the Portland native back for another project. The final project will be a dramatic addition to the Central Addition portion of Downtown Boise. He says he was inspired by the historic Fowler house which once stood on the site and gave the building its name. LocalConstruct’s director of construction Patrick Boel had an idea. "We think... Lewis did a great job with the mural at the Watercooler so we were eager to work with him again on the Fowler," Boel said. "We are excited to once again contribute to the City's arts and culture." The silhouette of the house and Boise foothills will be framed by what Lewis calls a "dramatic western sky." "The majority of the mural is skyline that will help soften the building's mass when viewed from Myrtle," Boel said. Lewis started work on Saturday and already has made dramatic progress. He says as time goes on the work will take longer as he works on detailed areas - but expects the full mural to be done by early September. He hopes his work will be an enduring part of Downtown Boise for decades to come. Boel said the project will cost LocalConstruct $60,000. Office Evolution has applied to build out a space in the One Capital Center building on Main St. - perhaps better known as the CenturyLink building. The concept will compete with Regus - which operates a similar concept in the Banner Bank building and the Trailhead and Trailhead North along 8th Street, among others. A small new grocery store is planned for the new Kount building under construction at 10th and Main in Downtown Boise. Bodega Boise is described as a small neighborhood market, and will take up about 1,500 square feet of space on the ground floor of the building, and is slated to open by November. It will be located on Main St. near The Olympic hotel building. A new garage door opening will be added to the front of the building, and a small outdoor seating area will be set up. Interior progress at JD's Bodega. Via. As first reported on BoiseDev last year, it will join JD's Bodega, which is currently under construction about four blocks away on Capitol Blvd. across from Boise City Hall. That market will be slightly larger at nearly 2,000 square feet, and include seating and a small prep kitchen. That space is nearing full buildout, according to photos posted on Instagram. The Capital City Development Corporation changed its policy earlier this year to bar motorcycles from using the upper floors of the parking garages it owns in Downtown Boise. The agency says there are "entry/exit issues with such small vehicles." As an alternative, motorcycle riders can now park free of charge in special designated areas on the ground floor of two garages - the 9th & Main garage (formerly Eastman) and 9th and Front garage (formerly City Center). CCDC upgraded lightning and paint, and added signage letting motorcyclists know of the option. Parking staffers will be putting fliers on motorcycles who are parking in paid spaces that they should no longer do so. The aim of the literature is to let them know "while we appreciate their paid patronage, we'd rather they park in a safer, more convenient location within our system." Have you ever been to the downtown Boise Public Library and felt a bit like you were inside an old warehouse? 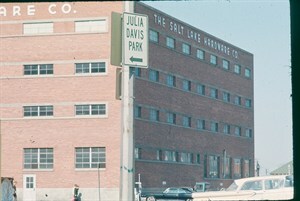 The City of Boise moved library services to the former Salt Lake Hardware Co. warehouse on Capitol Blvd. and Battery St. (now River St.) in 1973. It replaced Boise's original Carnegie Library on Washington St. and has stood pretty much unchanged for the last 45 years or so. Now Boise City leaders hope to raise that old warehouse and build a new library, arts and history campus on the site, facing the Boise River. "We want a facility that connects the community," library director Kevin Booe said. "We want a place where people will come and do lots of different things." The project, if approved and funded, would completely revamp the current site of the library, with the old hardware warehouse tumbling down, and a new complex rising up in its place. City and library officials contracted with Safdie architects, which has designed libraries in Vancouver, British Columbia, Canda and Salt Lake City, Utah. For Boise, the firm has turned in initial designs that are geared toward the Boise River and Greenbelt. "We want a building that engages with the river," Booe said. "You can't even see the river from the (current) library. This concept faces the river. We would like a space where the indoors and the outdoors merge and it’s almost transparent." That comes in the form of a large wall oriented south. "(It features) a glass wall, they call it a lens," City of Boise Capital Projects Manager Shawn Wilson said. "This is (Safdie's) concept of how they are going to interface with the river and the riparian area of the Greenbelt. It provides a place to sit and watch - or sit and read." Retail spaces for a gift shop, cafe and other library and arts-related concepts are also envisioned. 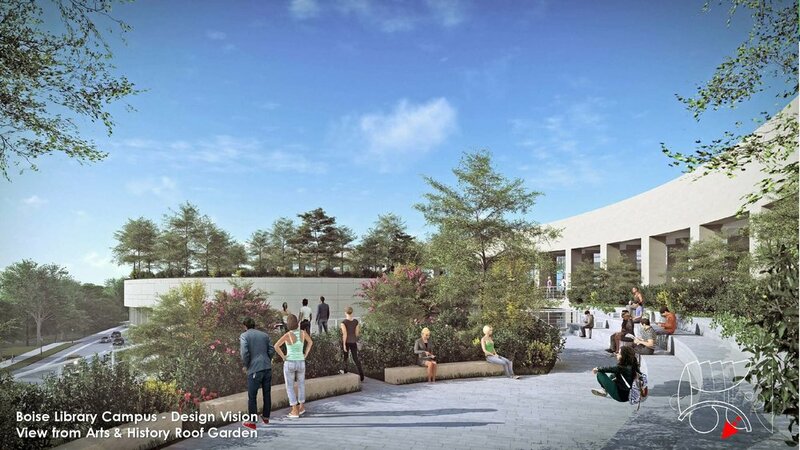 Two rooftop gardens are part of the current plan - one on top of the events space, and another on the arts & history section of the complex. Right now, the Boise Public Library has about 350,000 items in its collection. Booe says he would like to see that grow to the million item mark, similar to cities like Salt Lake City, Utah and Des Moines, Iowa. That would be accomplished with an automated storage retrieval system - a robot-like device that can snag items from a vault and deliver them in under five minutes. The City of Boise Department of Arts & History currently works out of a cramped space inside City Hall. By moving down the street to the library site, it would be able to do more and give the public more access to its archives and programs. Arts & History director Teri Schorzman says the Sesqui-shop on Main Street during Boise's sesquicentennial in 2013 was a test run for the concept. "(The Sesqui-shop) was focused on local art and local history," she said. "That’s the goal for what we do in this space where we can continue that kind of programming." The space would also provide a dedicated cultural education center, gallery space, the Boise city archives, a conservation lab, and space to maintain the city's growing art collection. It would also house current arts & history staff. One historic item may go by the wayside, however. The plans currently show The Cabin being removed to make way for the new campus. "The Cabin may move," Outreach and Education Coordinator Jennifer Yribar said. "We are working with the Cabin's Executive Director and Board to find a sustainable solution for the organization that will allow the Cabin to maintain their physical identity with minimal disruption to programs and services." The city says its research shows there is a need for an events space in the Downtown core with room for 300-400 patrons. It would contrast with the Velma V. Morrison Center for the Performing Arts which seats about 2,000 guests and the Egyptian Theater which seats about 760 people. This "black box" style theater would include a stage, dressing rooms, VIP rooms, concessions, offices, technical areas and more. It could be used for a variety of community and smaller-scale events and could complement Jack's Urban Meeting Place and facilities at the Boise Centre. The old warehouse would be torn down if the current plan is followed. The library wouldn't close however, with two options being discussed. "We could stay in the current four-story building while the library part of the campus is built," Booe said "then tear down the old building and complete the rest of the project." Booe said the other idea is to relocate the library to another location downtown temporarily. "We are looking at an analysis on the cost of that," he said. "Trustees and staff are adamant that the library continues to stay open, even if it is with a diminished service." In addition to the library, the parking structure could use funds from the Capital City Development Corporation to provide patrons of the library and other nearby properties parking. “Our current parking lot is 102 spaces," Booe said. "The biggest complaint we get is, 'you don’t have enough parking.' Like it or not, people drive. You need between 200-300 parking spaces. So that’s what we are planning to do." "That part of town could use a little help in that sense, and that goes beyond the library," City of Boise Director of Communications Mike Journee said, citing events across the street in Julia Davis Park, the new Idaho State Museum and growing activity in the River St. area. CCDC is working to sell its garage under the Grove Hotel to raise some of the funds needed for the library garage project, as BoiseDev reported this spring. Another series is also planned for September after revisions are made based upon feedback collected next month. "There may be some changes as we go along," Booe said. "We know we are going to have to do a lot of value engineering, and after we go through the concept, feedback with the public - we might have to make some changes based upon public feedback." That value engineering is important - because the current concepts are estimated to cost well over $100 million. The plans will have to be downsized to fit in the $80 to $85 million budget. "This is and was community built," Yribar said. "It’s the culmination of so much community visioning. We are going to council tomorrow to make sure we are going in the right direction to keep going, but really we are going to the public to get their reaction." If a design can be finalized and funding secured, groundbreaking could happen as early as Fall 2019. If all goes as planned, the new facility could be open as early December 31, 2021. With competition for hotel-goers heating up, the Grove Hotel plans a revamp of its lobby. 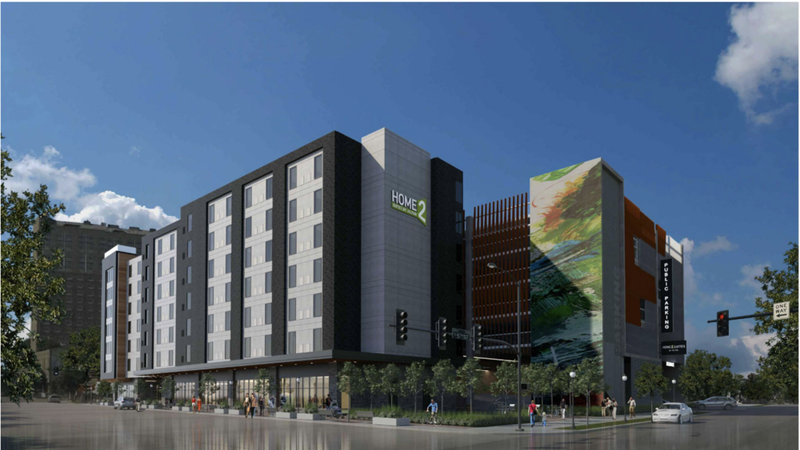 "We plan to update the hotel's first level, including our restaurant, lobby, bar and front desk," Grove Hotel Managing Partner John Cunningham said. A building permit has been filed with the City of Boise for $1.18 million in work to give the area a complete cosmetic upgrade. A new wrap-around bar and lobby library are planned in addition to upgrading the overall look. "Updating the hotel is an ongoing, never-ending process," Cunningham said. "We felt it was time to reinvest for our guests, to keep our product fresh and current." The Grove is working to keep its place in an expanding market. "Our guests have high expectations when they visit our hotels and CenturyLink Arena. As a result, we plan to keep reinvesting in these properties to meet those high expectations." The project should start in late July and be wrapped up in September. New downtown public park in the works: what do you want to see? Public feedback is being sought on design concepts for a new urban park planned for Downtown Boise, first reported late last year by BoiseDev. Idaho Press notes the park will be adjacent to a new 10-story office building also being planned for the block between 11th St. and 12th St. on Bannock St. This concept would feature an event lawn, plaza area, parking for food trucks, portable stage and more. A movie screen could be brought in for movie nights, and cafe seating would be available for food truck patrons. Event space in this configuration could accommodate as many as 1,500 people. Trees currently on the site would be removed and replaced. Some sort of "focal feature" that include a water fountain would work to draw folks in from Bannock St. and 11th St. Thirty-two surface parking spots would be retained, and surrounded by a grass berm. This concept is similar to the first idea, but would orient the event lawn in a diagonal fashion, and would add space for some native plantings. In this layout, 1,200 people could enjoy an outdoor movie or on-stage event. Three types of "focal features" are being considered - including interactive art, a water feature or a fog/mist feature. Planners want the feature to be "iconic, interactive, unique and playful." Both ideas could feature ammenities like free wi-fi, bike racks, charging stations, lawn games, restrooms and a place for Boise Green Bikes. You can make your vote here. A Boise City Council workshop is set for June 19th at Boise City Hall. Approval could come this summer, with construction slated for spring of 2019. Another mixed-use residential and commercial project is in preliminary stages for Downtown Boise. Portland-based developer LocalConstruct plans to build The Cartee Project, which could include retail, restaurant, office, parking and mutli-family residential. The first step is an agreement to rezone the parcels of land at the corner of 4th St and Broad St. in Boise from residential to commercial. The empty lots currently host surface parking, but once featured a number of houses in Boise's Central Addition before they were demolished in stages over the last 15 years. Developers held a neighborhood meeting and told the four people who attended the goal was to "create a contemporary urban experience downtown," and said the change in zoning from residential to commercial was needed "for us to be able to bring another genuinely walkable, urban, mixed-use housing project to the Downtown Core." The application describes the residential as being apartments, and says the project could be seven or eight stories in total. This new effort is said to be similar to the nearby Fowler which Local Construct completed earlier this year. A massing diagram for the project shows an eight-story building with three floors of parking and commercial/retail, with five stories of residential above it, though the final building form was not formally submitted to the City of Boise and would come later as part of a design review process. The room boom in Downtown Boise continues - with new milestones on a hotel project at 5th St. and Front St. The project, put together by local developer Clay Carley and Madison, Wisc. based Raymond Group, will include a 140 room hotel and 600 space parking garage on a large parcel bound by Front St., 5th St, and 6th St. The hotel will carry the Home2 Suites by Hilton brand Carley confirms. The Home2 brand is an all-suite hotel concept aimed at travelers who need to make extended stays. The Capital City Development Corporation approved $1.478 million in funding for a raft of improvements surrounding the hotel - including utility work, pavers, street lights, benches, bike racks and the like. The project is expected to cost $43.25 million, and is on track for a late 2019 or early 2020 opening. Carley will own and operate the parking garage while Raymond will do the same for the hotel portion of the project. The nearby Hampton Inn and Suites is also operated by the Raymond Group. The hotel will feature an indoor pool area with features like geysers and a basketball hoop. A bar and lounge is also planned, with patio space along Front & 6th, with an indoor/outdoor fireplace. A public plaza is set for the corner of Front and 6th, with a lawn area, brick pavers and trees. The joint venture of Carley and Raymond is acquiring a so-called "remnant parcel" owned by CCDC that used to be the roadbed for Front St. before it was realigned more than 30 years ago. The group will pay the public agency a discounted rate of $300,000 - with the agreement that the hotel and garage must be built within three years. CCDC will then provide the $1.478 million in public dollars for the public improvements. CCDC agrees to lease 200 spaces in the garage for $150 each per month - or a total of $360,000 per year. CCDC will then resell those spaces. A directional sign on the Boise Greenbelt is a trial - part of a plan that could expand if funding is found. BoiseDev friend Wade Dorrell noticed the sign, which includes a colorful map of the Greenbelt, plus directional arrows to nearby attractions near the Main Post Office. "This sign is a prototype that was installed over a year ago," Boise Parks and Rec Communication Manager Bonnie Shelton said. It is part of a wayfinding plan by the City of Boise that includes "portions of the Greenbelt including Americana to Broadway and Julia Davis Park." Shelton says for now there is no funding to roll out more signs - and the prototype is helping the parks and rec team see how materials hold up etc. The Capital City Development Corporation is also working on a wayfinding plan for the Downtown Boise core and gateways to the city that is in the testing phase. Shelton says this is separate from the effort but the signage carries a similar design. The former Addie's space will soon have a new tenant focused on a single product: cookies. Chip Cookies has applied to convert the former breakfast eatery at 5th St. and Main St. into a 2300 square foot chocolate chip cookie bakery. The company started in Utah and focuses primarily on the single cookie variety, but will also offer a chip of the month (i.e. Cadbury Chip around Easter). You can also snag a bottle of regular or chocolate milk. "We believe in keeping things simple and focusing on creating an amazing product," Sarah Wilson with Chip Cookies said. The new bakery will be 2300 square feet and will include seating for about 22 people. The company has a similar set up with a walk-up bakery combined with delivery in Provo and Salt Lake City. Chip is already delivering in Boise, limited now to late-nights. When the new store gets up and rolling, it will be noon-2am Monday-Friday and noon-midnight Saturday. Delivery will continue to run 8pm-2am M-F and 8pm-midnight on Saturday. No cookies on Sunday. "We don't have an exact opening date, but hope to be up and running by the end of the month," Wilson said. "BUT you know how construction goes..."
There won’t be a line at Jenny’s Lunch Line today. The business is closed, and the crew behind the counter is no longer involved. The business located behind Wise Guys Pizza at Sixth and Main served fresh sandwhiches and soups with a rotating menu. Married couple Kristy Scott and Jen Oneida have been working to purchase the business and earlier this month started promoting a GoFundMe account to help. The goal is $24,000 - and about $3,700 has been raised. But the campaign didn’t come in time to make things work. The couple says they could not reach a deal with current owner HBM Marketing and decided to walk away. ”We love our customers, and never want to disappoint you. Jen and I are trying to figure out future endeavors, and hope that our break from making food for you, is a brief one,” they wrote. The couple says any funds raised from the GoFundMe campaign will help them start a new venture. Greenstone Properties took the first official step in making the Boise Sports Park a reality. 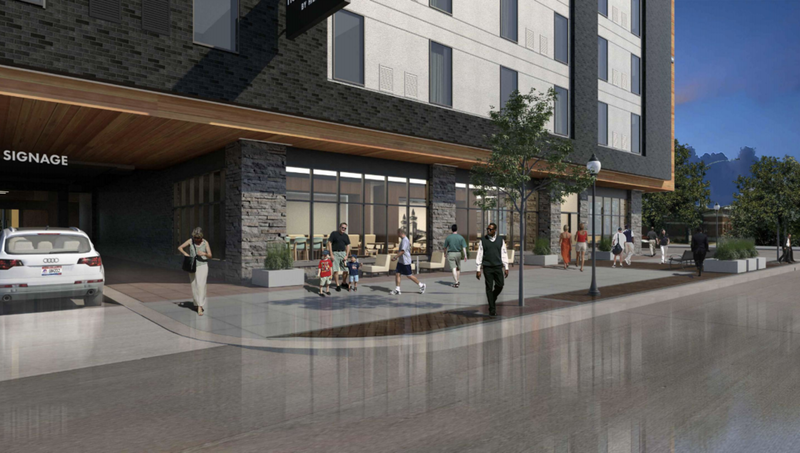 The development company's attorneys filed a rezoning request with the City of Boise this week, which outlines the project in detail and requests several parcels get new zoning designations to allow for the mixed-use project the group hopes to build. The total site is 11.65 acres in site, including the large former Kmart site (currently home to St. Luke's Health System back office functions) and several other locations nearby. The project would also include 60,000 square feet of retail, 300 multi-family housing units, 700 parking spaces and 120,000 square feet of office space. Two multi-family housing buildings are envisioned - the first would be located on Shoreline Drive and include 40,000 square feet of retail, 240 housing units and public plaza space. The second would be located along Americana in left field of the ballpark with 60 housing units. A large office building would include 120,000 square feet of offices, plus "integrated event space on roof and balconies." A parking deck would feature 700 stalls. The letter to the City of Boise emphasizes that many event-goers are expected to carpool to events, or park and ride to the site, and claims the on-site parking is sufficient to meet the venue's needs. “Improvements to Shoreline between Americana and 14th to create a festival street, permitting its use for various public and private events connecting Multi-family 1, the Boise Sports Park and Greenbelt." Geoff Wardle, the attorney who represented Greenstone at a contentious neighborhood meeting last week filed a large 29-page application letter. It goes into significant detail about how the project meets city goals and initiatives. The document discusses the Blueprint Boise plan that governs growth in the capital city and devotes significant space noting how it complies with the principles and policies put forth. 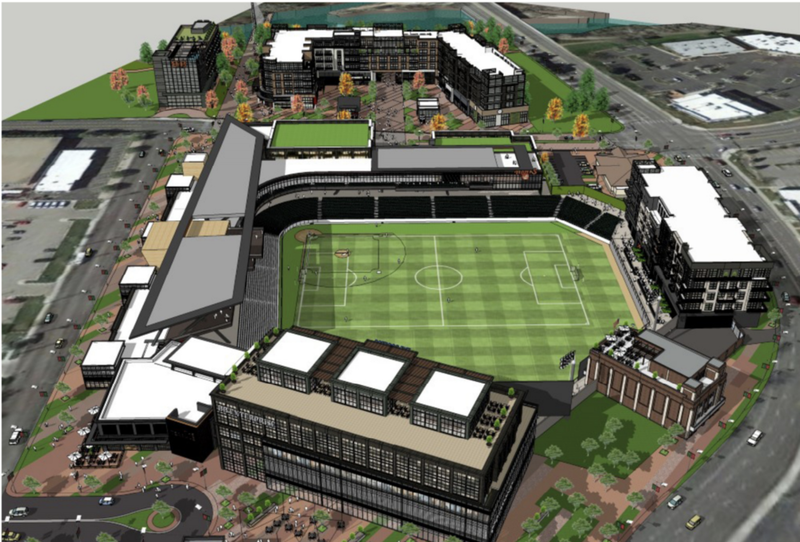 “The redevelopment of a big box commercial site with a mixed-use project anchored by the Boise Sports Park and with ready alternative access to pedestrians and cyclists within the Downtown planning area satisfy all of these goals," the letter said. Both tax dollars and private contributions would fund the project. The Greater Boise Auditorium District, Capital City Development Corporation and City of Boise have all been involved in the project and could each contribute cash or bonding capacity. The zoning request will head next to Boise's Planning and Zoning Commission, with a date not yet set.